It’s check-in time! How was your first week of finding a work-life balance? Did you try scheduling activities throughout the week? Did you follow that schedule? Did you enjoy yourself? Since this was my first attempt at setting aside time for play, I’d say it went pretty well. 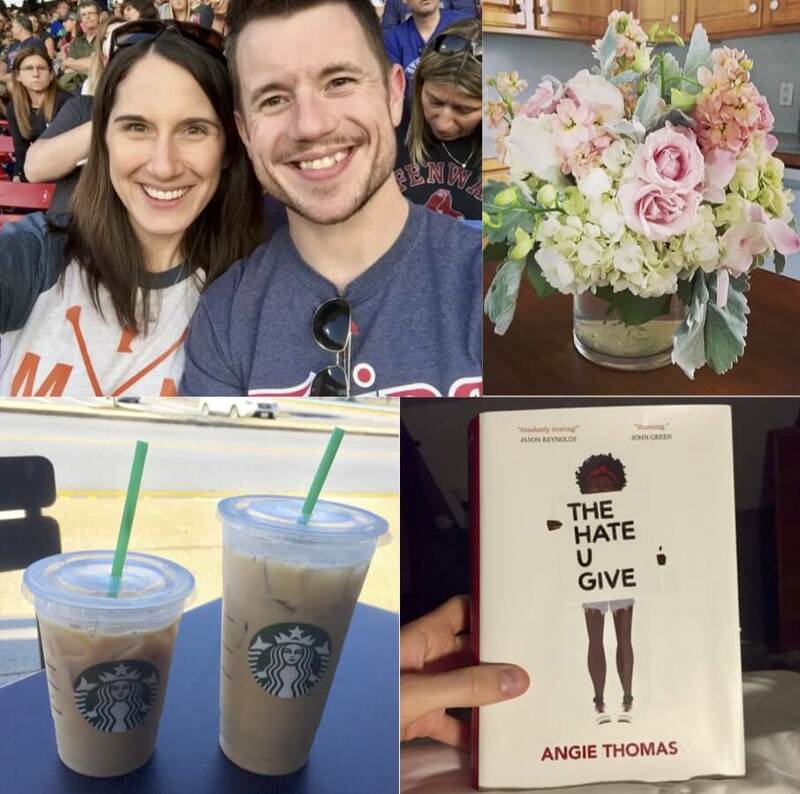 My husband and I had a great time at the Twins v Red Sox game last Wednesday; yes, we were THAT couple adorned in Twins gear at Fenway Park. Catching up with my friend over coffee Sunday morning was also wonderful…especially because I missed our date last week due to – you guessed it – work. I finished reading a captivating book that a friend recommended (I recommend it too; if you’re looking for a new read it’s called The Hate U Give). And although I didn’t squeeze in a movie night as planned, Ryan and I binged a couple of Wire episodes in our sweats, which in my humble opinion, is even better than going out ☺). It felt great making time for these activities, but I’ll be honest, I still felt anxious (even guilty?) about not working during that time instead. I have a sneaking suspicion that I’m not the only one feeling this way, and that’s what I want to work on this week. I did some research, and I’ve found a few tactics to address this imbalanced thinking. First is a shift in mindset. This will undoubtedly take time, but we must start seeing the “life” stuff as equally important as the “work.” I know, I know – WAY easier said than done. Bear with me. If you catch yourself thinking, “I should really be working on X (answering emails, editing my book chapter, Thursday’s blog post, etc.) instead of Y (reading this book, going for a walk, or having coffee with a friend,)” stop that thought process and ask yourself: is this true? What would happen if that email waited a few hours or (gasp) until tomorrow morning? Would the world end? Alternatively, what will I gain from taking time to talk with a friend or rejuvenate myself with some fresh air? More often than not, I think you’ll find the pros outweigh the cons for the latter category. Now I fully acknowledge that this is a slow process, but let’s try it for the next few weeks and see what happens. I think it will help. While this may be a slight exaggeration, I’d say there are usually at least ten significant projects on my list, and let’s be honest, I’m just setting myself up for failure. No wonder I feel like I don’t have time for fun; with an unrealistic and unending list of work goals, I never feel that I’ve done “enough” to warrant play. Do you ever feel this way? 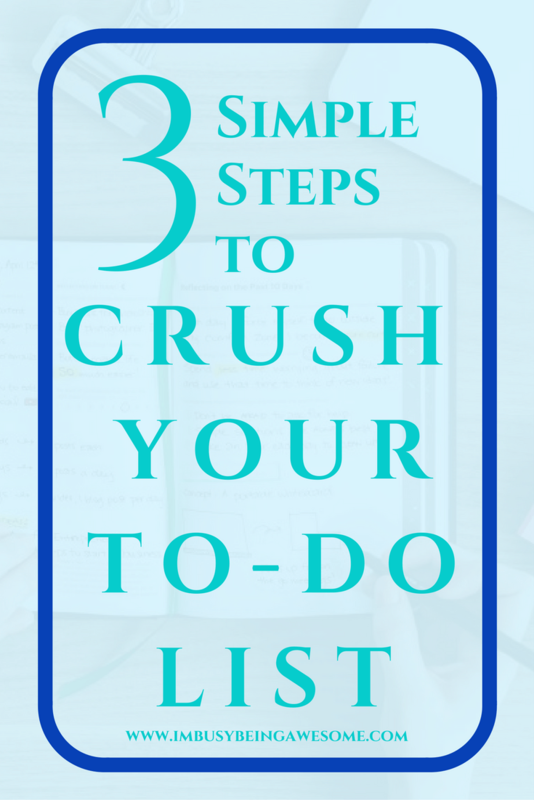 Does simply thinking about your to-do list make your chest feel tight? Let’s work on that this week. Today I want to focus on our daily to-do lists – that never-ending list of responsibilities that gobbles up all of our time for fun. First, I’d like us to take a step back and think about what we need to accomplish this week. What are the things we must get done in the work category? As you identify your goals, remember to be realistic and specific. For example, I should not just write “finish editing book”; that simply won’t happen in a week, and I’m once again setting myself up for failure. Instead, I must think realistically about what I can accomplish in a week. Look at your week and decide what specifically you want to work on. Take two minutes to write that down. Go ahead…I’ll wait. As you can see, I have three work goals with one “extra” if I have time. 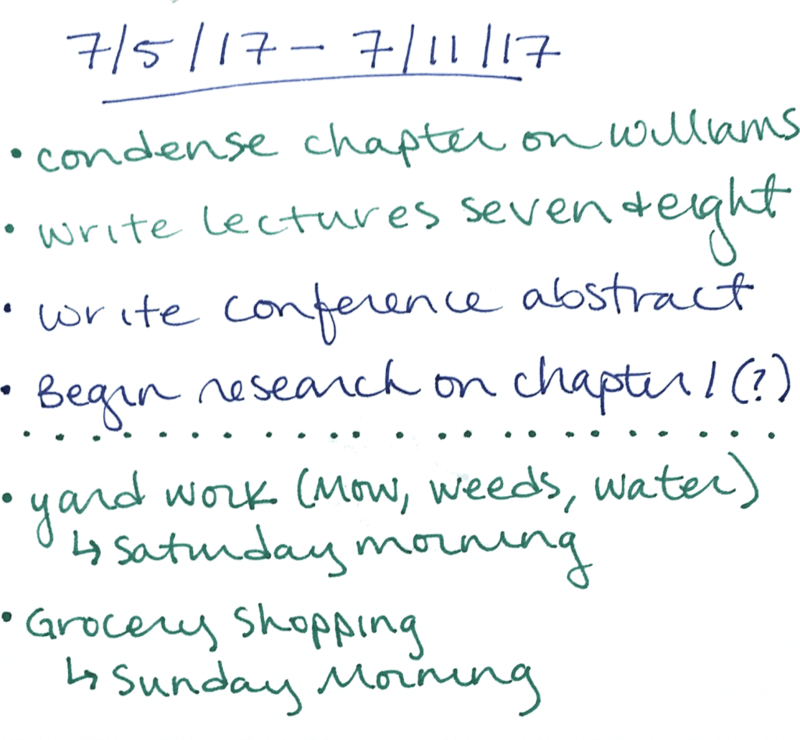 I also have two “must-do” weekly tasks, which I designated to Saturday and Sunday. This brings us to our next step. Take a look at that master list. Think about how much time each item will take, and then keep this in mind as you map out your week. When you plan each day, follow the same two rules as above. Be realistic and be specific. 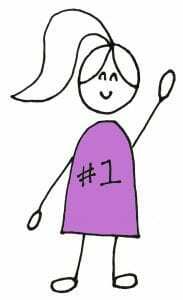 Ask yourself: what exactly do I intend to accomplish today? Is this a realistic goal? Some tasks might take longer than others, and some may be multi-day projects. Make sure you keep all of these variables in mind, so you don’t overwhelm your list. That’s it. That’s my Wednesday. I know the Williams task will take many hours, so I will work on that first thing when I’m at my best. I will tackle the abstract in the afternoon. I’ll check email after lunch when I’m getting back into work mode. Once you have completed your realistic and specific to-do list, get to work! You have just created an attainable set of goals that, once finished, means you’re done for the day. Don’t worry about the other stuff on your Master List. You have already mapped that out; it will all get done. So that’s it – that’s Week Two of finding your work-life balance. Shift your mindset and question your thinking. Is it okay to leave the email until tomorrow? Can it wait so I can take a walk with a friend? Don’t set yourself up for failure. Shorten your to-do list with Realistic and Specific goals. Once that daily to-do list is complete, so are you. Time for fun! 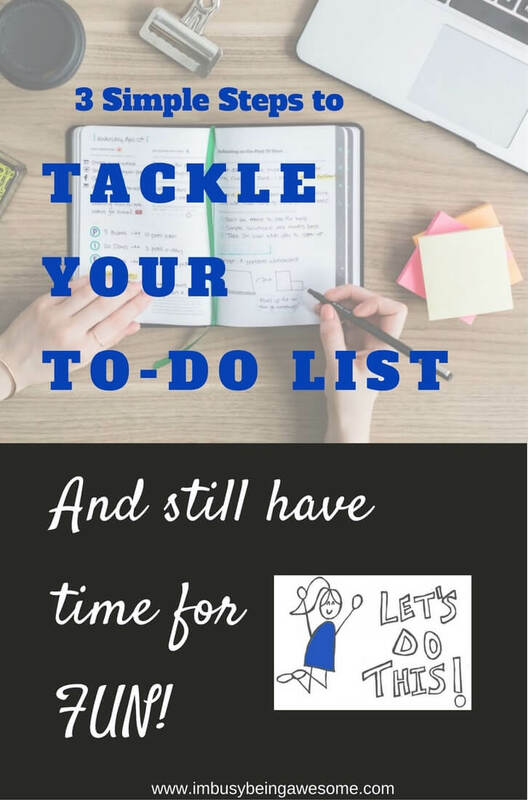 (As a side note, when you plan your day, keep in mind what time you are the most productive and plan your most challenging task for that time – this makes a BIG difference. I work best in the morning, and I am worthless come 3:00-4:00 p.m. – I can’t keep my eyes open, so I usually walk Bruno at that time). How did week one go for you? Did you try scheduling your activities? 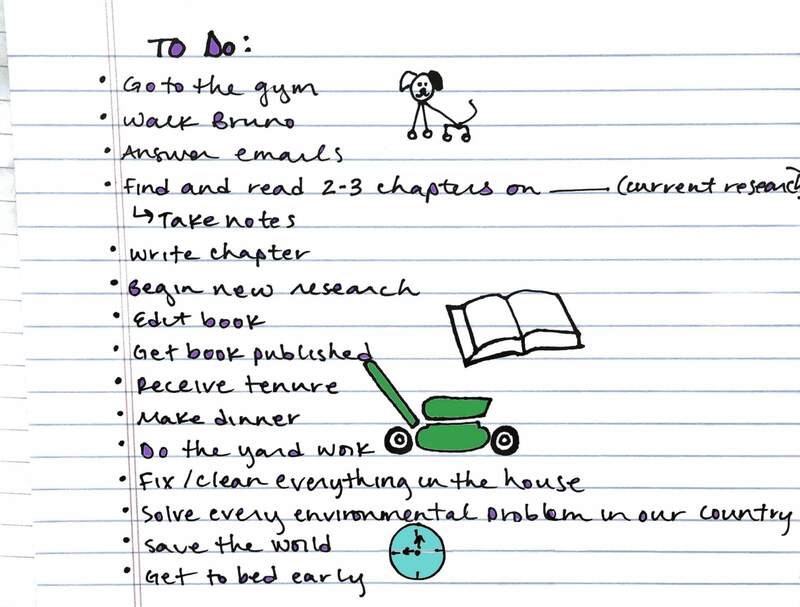 Do you have any special tricks for accomplishing your to-do list? Let me know below! Great tips. 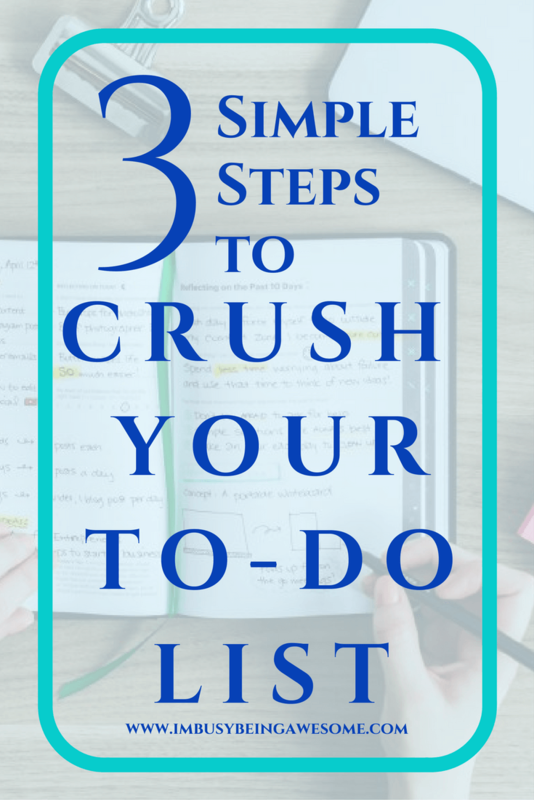 It’s SO hard to not be a slave to the to-do list! These are such smart ideas! 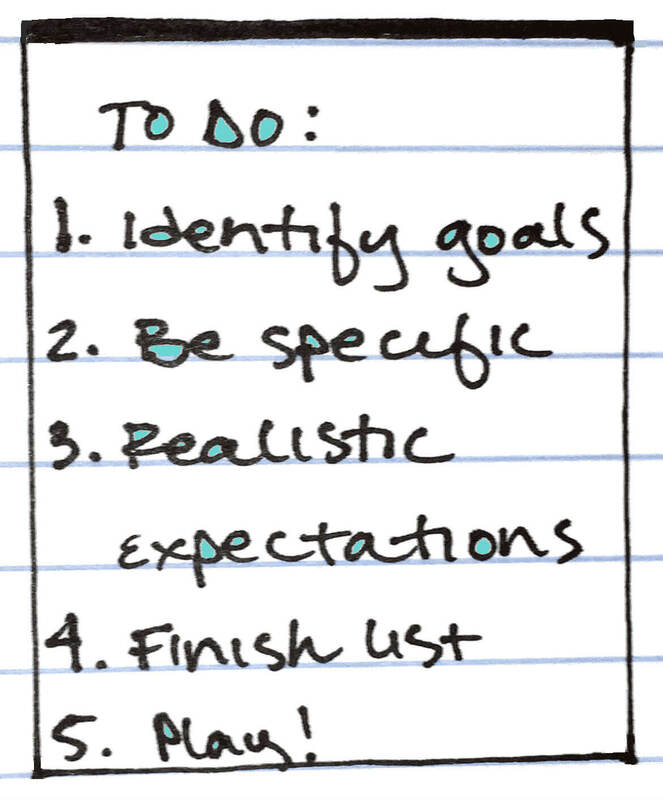 I love the idea of making your goals/to-do list items realistic and specific. It helps me to not feel like a failure at the end of the day if I don’t accomplish my lofty goals! Haha, my to-do list looks very similar to yours! 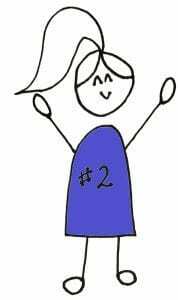 My husband always shakes his head when he sees me adding to my 3 page long list. And I never schedule fun things… something to work on! Good tips! 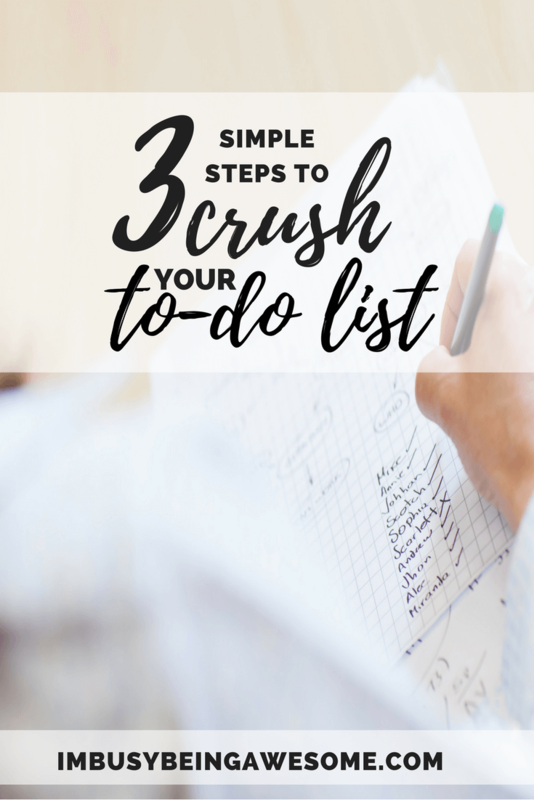 I love lists and have learned that keeping things small and simple helps! I loved your to-do list and laughed out loud as it escalated from “walk Bruno” to “save the world”. This post was so relatable! Ha, thanks Kate 🙂 It’s crazy how much pressure we put on ourselves to “get it all done” each day, isn’t it? Love this! My lists are always too long and overwhelming. Focusing on more specific daily goals is huge help for me! Awesome tips. I need to work on focusing on one thing without getting distracted by what I have to do next! Starting on realistic goals are super important – and then working from there. That’s what I do! Got to love to-do lists! Love these tips! I like that you sort of seperate things a bit, because the master list can be SO huge, that it almost seems out of sight! Exactly! If we make our list too GIANT, it’s intimidating to even start. Glad you were able to get some fun time in! I plan/schedule fun stuff just like I do work stuff, it helps me to make sure I get some fun in even when there is a lot going on. 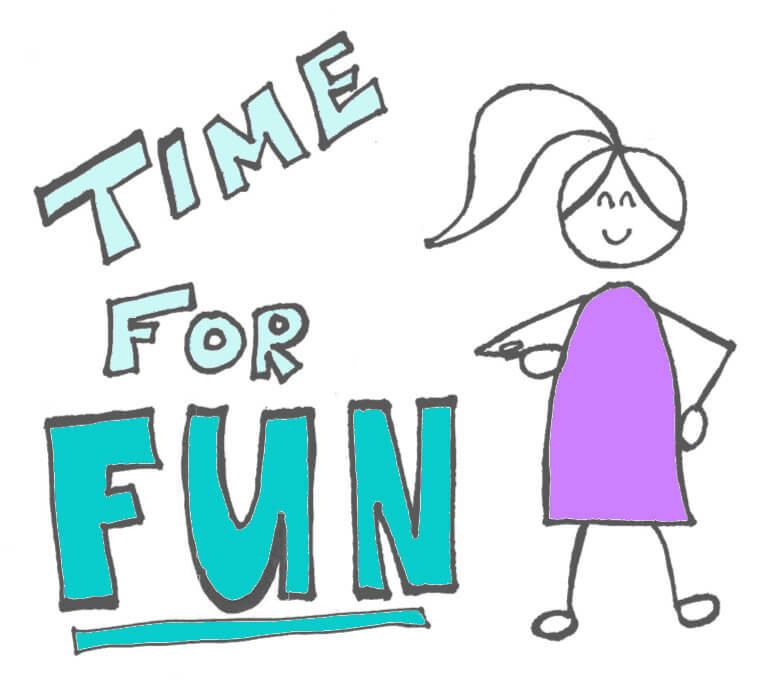 I love that you schedule in time for fun – that is so key! Ha! I think we all fall in that category at some time or another 🙂 I hope these tips help! OMG! This was such a timely post for me to read. Thank you for sharing it! I have felt so unproductive even though I am constantly spinning my wheels. I know I need to have a better morning routine so I can use my time wisely. 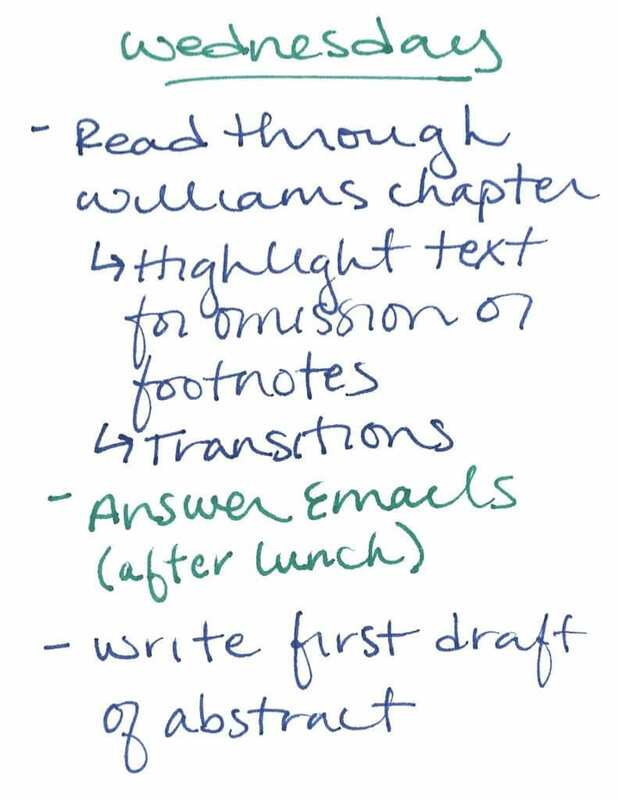 But focusing my to-do list and being strategic with what items go on it will be a BIG help! I feel the same way. I hope these tips help!